In today’s episode, I answer three listener questions. I periodically will make a call for listener questions, usually on my Instagram page, so if you’re not following me, make sure you do that so you can submit your question next time. You can follow me at @veronicaegrant. I LOVE the questions that you all submitted to me, and I’m super excited that one of the questions came from a man! 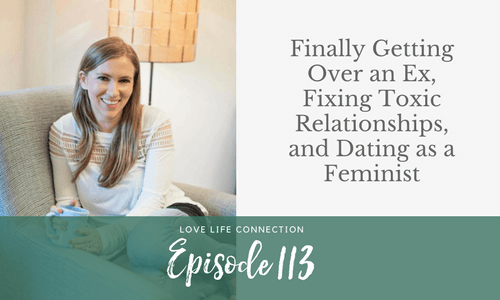 The questions are on getting over an ex (even when you know it would’ve never worked out), how to fix a toxic and codependent relationship, and how to date as a feminist when most men are not. I agree everyone has an inherent biased to be sexist, just like we all have an inherent bias to be racist. It’s the society we live in, and we all have to consciously work to not be at the default. My only point is that the feminist movement in the beginning was about women acting like men… but if you think about it, that’s basically saying, men are the standard, so we’re going to act like that to gain equality. I reject that notion. I don’t think women have to act like men to be equal, and that’s only buying into the belief that they’re the gold standard. Hi, I just wanted to let you know that most men ARE sexist, because patriarchy! it’s the default! Most women are sexist too. It’s the air that we breathe. This is just not a belief, it’s a fact. Also, feminism is not about women becoming more masculine or more like men, that’s a prejudice and a misunderstanding. I recommend you read more about social justice in general, oppression, sexism, patriarchy, privilege, etc.